Posted by flashlightblog in Author Notes, Dragon, Illustrator Appearances, Imagination, Individuality, Play. Today I received a truly splendiferous email. It seems a fifth grade teacher challenged her students to take a favorite story and turn it into a graphic novel. One of her students chose When A Dragon Moves In…and her mom not only shared it with me, but gave me permission to share it with all of YOU! Isn’t this fantabulous? Isn’t this young artist fantabulous??? Thank you, thank you, thank you, Sarah. Like Howard McWilliam (the illustrator for When A Dragon Moves In and When A Dragon Moves In Again), you’ve brought my characters, my vision – my dream – to life! You’re an inspiration to all of us, and we can’t wait to enjoy more of your talents! Posted by flashlightblog in Author Signings, Dragon. 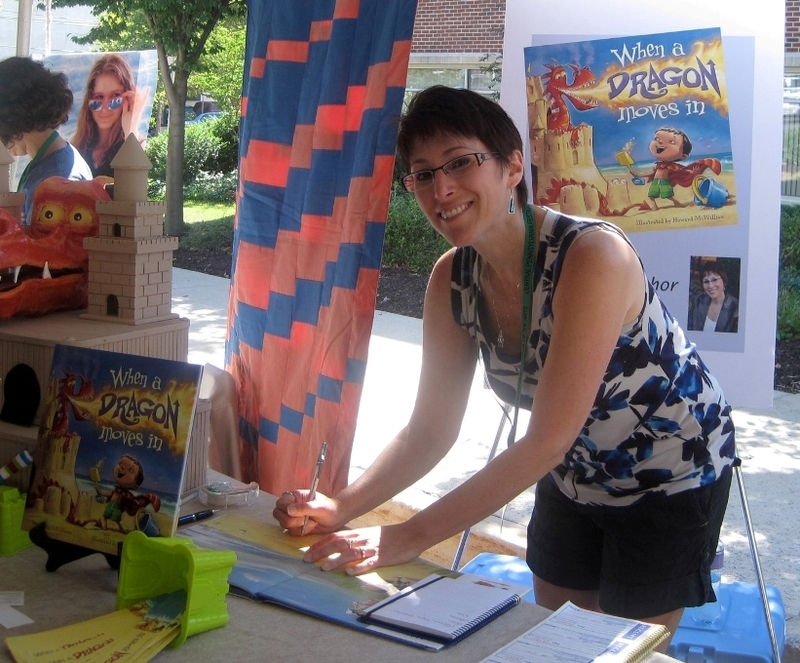 Jodi Moore – author of When a Dragon Moves In – attended the Central Pennsylvania Festival of the Arts’ Bookfest on July 13th, 2013 along with the dragon himself, made from recyclable materials by Jodi’s son, Steve. Here are some pictures from the event! Posted by flashlightblog in Dragon, Food. In honor of International Edible Book Day, the Louisburg Library in Kansas held a book-themed cake competition, on April 1st. Rachel and Aiden Wood’s dragon cake, modeled after When a Dragon Moves In (written by Jodi Moore, illustrated by Howard McWilliam), landed first prize in the category of most artistic cake, as well as winning the People’s Choice Award. Read more about When A Dragon Moves In here. Posted by flashlightblog in Dragon, Interviews, Podcast. 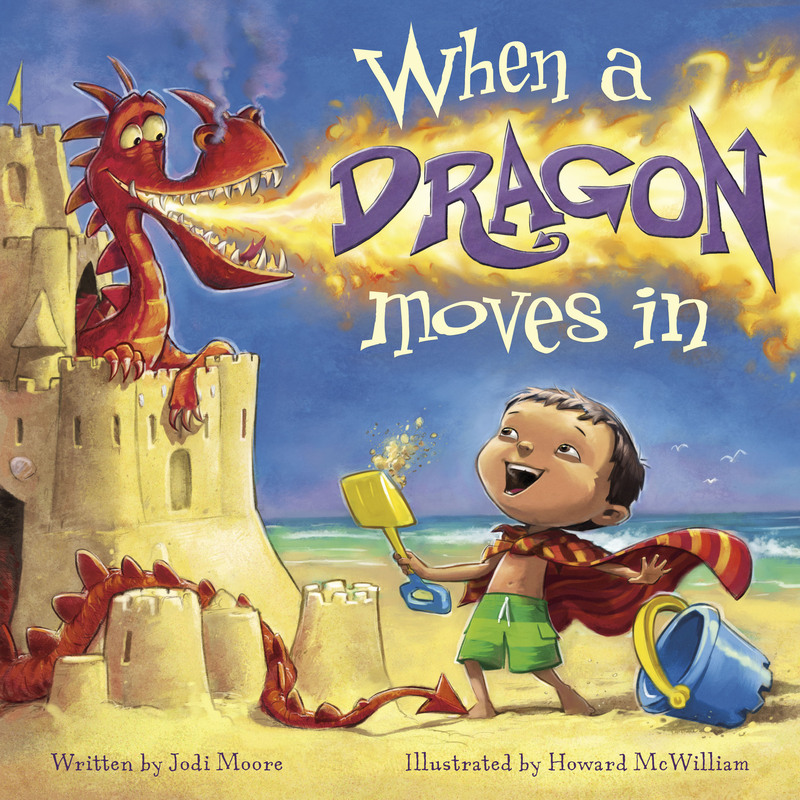 Barbara Gruener, school counselor in Friendswood, TX, interviewed author Jodi Moore about writing When a Dragon Moves In. You can listen in here, and read Barbara’s review on The Corner on Character blog, here. Posted by flashlightblog in Barnes & Noble, Book News, Dragon. When a Dragon Moves In is included in Barnes & Noble’s Best Kids’ Books for Easy Gifting online store, as well as in their Picture Book Favorites online store. Posted by flashlightblog in Dragon, Summer. This past Saturday, August 6, was a cloudy/overcast day in Amagansett, NY. Nevertheless, the East Hampton Sandcastle Contest had 88 groups enter the sand sculpting competition and spectators swarmed the area as if it were a sun-shiny day. Thank you to Rossetti Perchik and the Clamshell Foundation for all of their cross-promotional efforts. With at least one more month of beaching it this summer, check with Bianca Schulze’s post on suggested reads. When a Dragon Moves In tops the list! Posted by flashlightblog in Dragon, Imagination, Summer. The Kidz ‘N Kastles Sandcastle Competition, sponsored and organized by the U.S. Open Sandcastle Committee and the Imperial Beach Optimists Club, took place Saturday, July 23, in Imperial Beach, CA. Khari Johnson reported on the event in the Imperial Beach Patch. Decorations were permitted but had to be biodegradable materials or things found at the beach, like seaweed or seashells. Food coloring was also permitted. Each team of five was accompanied by an adult supervisor who was not allowed to assist in the construction of sand castles or sculptures. Top placing teams won a trophy, a $10 savings account from North Island Credit Union, a gift card for the Reuben H. Fleet Science Center, a free haircut at the Hair Force Barber Shop, and a copy of the book When a Dragon Moves In, a story about a little boy, his sandcastle and a dragon. Awards were presented by Miss Imperial Beach Meghan Sherman. 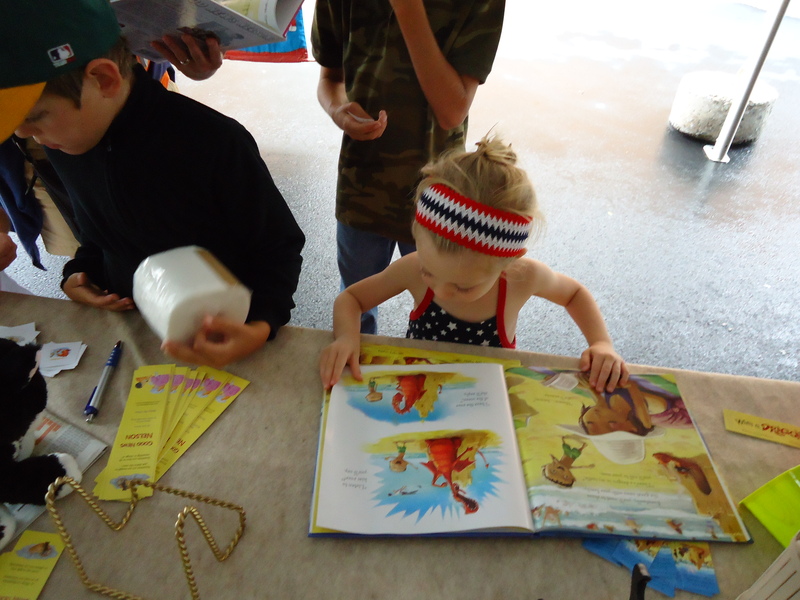 Posted by flashlightblog in Author Signings, Dragon, Imagination, Summer. I’m one of these people who just can’t wait to bite into the chocolaty center of a Tootsie Pop, the creamy middle of a sugary doughnut, the gooey core of a caramel bar. So imagine my reaction when I was offered the chance to participate in BookFest PA, a book festival tucked into the heart of The Central PA Festival of the Arts. Sweet! And what do you get when you combine arts enthusiasts with avid readers? Some quite extraordinary people who, while varying in age, background, and interest, have come together to celebrate the power of the imagination. Nothing short of a little slice of heaven. Between 10 am and 5 pm on July 16, thousands of folks browsed the BookFest PA tent to share words and stories, and to meet some very talented writers and illustrators. (Yes, I was admittedly fan-gushy to be in such lovely company.) I’m thrilled to say that Dragon “moved into” many a new, loving home that day! There is nothing more heart-squishy than watching a child hug your book. In addition, I was honored to present When a Dragon Moves In during a late morning story time inside Schlow Library. Our young audience became artists themselves, drawing pictures of their own “perfect sandcastles” – which I‘m sure are now proudly displayed on refrigerators across the nation! Each child received the highly regarded “Dragon” sticker for his/her work, as well as a bookmark. And of course, the Dragon himself made an appearance! A standing ovation – and a ton of thanks – to the organizers and volunteers of this amazing event. This was only the second year for BookFest PA, but with the success and smiles it brought to so many, I know I’m not the only one looking forward to many more!